Keeping your mouthpiece clean is an important part of instrument maintenance. Recent studies have shown that unclean wind and brass instruments can even be damaging to your health. 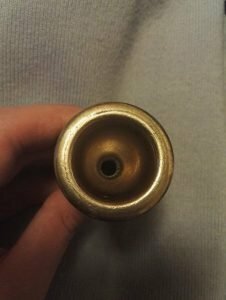 This article will show you how to clean a trombone mouthpiece and keep your ‘bone looking spotless! Before we learn how to clean it, we’ll look at ways of preventing the gunk accumulating in the first place. Do not play immediately after (or during) eating as this will cause food particles to be blown into your instrument. Give your mouthpiece a wipe down regularly after playing – this will get rid of the worst offenders and vastly cut down on the interior buildup. 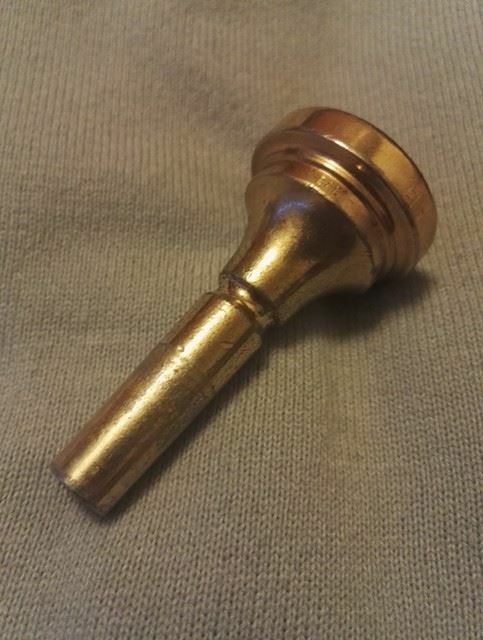 A mouthpiece in need of a wash! Submerge the mouthpiece in hot, but not boiling water. This will insure you do not damage the finish in any way. You can also add a couple of drops of washing up liquid at this point if desired. Leave to soak until all the dirt has loosened. How long this will take will depend on how much dirt has built up. Use a mouthpiece brush to remove dirt from the inside of the shank. Do this several times from both the shank and cup directions. Rotate the brush while doing so to ensure you get every bit of dirt from the inside of the mouthpiece. Rinse the mouthpiece with water and wipe down with a cloth. You now know how to clean a trombone mouthpiece quickly and easily. Be sure to do this regularly and remember, if you can’t see light through the shank then there’s something wrong!